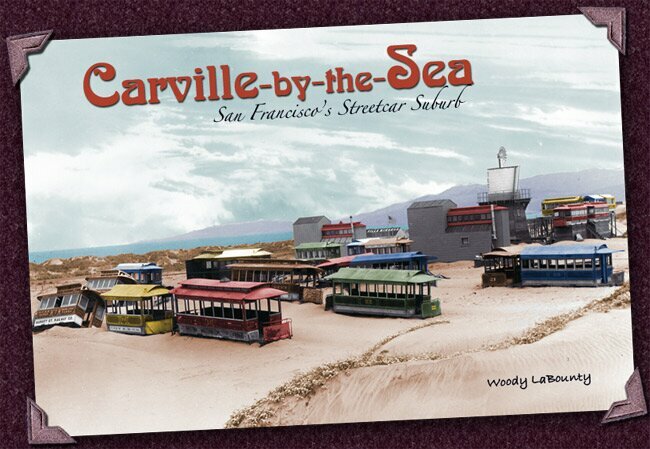 Book Remembers Forgotten San Francisco "Car Town"
Carville-by-the-Sea: San Francisco's Streetcar Suburb, a book by Woody LaBounty, vividly recalls one of the quirkiest communities in San Francisco's rich history. In the mid-1890s, San Francisco transit companies started selling surplus horse cars and cable cars to the public--$20 with seats intact, $10 without. Obsolete public transportation soon became bars and restaurants, shoe repair shops, playhouses, laundries, artists' studios, and even houseboats. A bohemian settlement erupted at the beach as writers, judges, and lady bicyclists arranged, combined, and even stacked old transit cars to create "Carville-by-the-Sea." This hardcover book contains 144 full-color pages with extensive footnotes. The lush design recalls an antique scrapbook with hundreds of rare images from libraries, archives and private collections. The book is available from Western Neighborhoods Project, or you can buy copies right here on the site today.